don’t we watch to hear their opinions anyway? So, I guess Chris Matthews said “Oh God” before someone spoke. Dude, who cares?!?!! Seriously, I was shocked when I heard d*ck on primetime tv. I didn’t know you could say that on primetime. I know when JT did that digital short on SNL, they beeped it out everytime. And that was around midnight! Those aren’t like a regular news broadcast anyway. Those are like commentary shows. Isn’t it the point for them to express their frustration anyway? Isn’t that why ppl watch? I know my sister loves to watch Keith Olbermann simply b/c of how he states his views. It’s total entertainment for her. Ok, so… not exactly thrilled about this one. But here’s another Conversations in Real life involving my dad. Let me 1st say that I haven’t been completely there this past week. Starting last Tues, I’ve been super-spinny. Yeah, that’s not exactly a technical term, eh? Well, I’ve been so dizzy that I actually got out of bed last Tues, & just fell to the ground!!! Like, couldn’t even stand up. It was like Bambi, but on an acid trip. The whole room just spinning around. That was all day last Tues. I didn’t go to work that day or the next (last Wed.). Then, Thursday, I kinda had to go to work, so I did. But I called my ppl (uh, that’s Kaiser, they have these 24-hour advice nurses to take calls) to see what they thought. They wanted me to come in to get looked at. My sister was having a HUMONGO party on Sat in Detroit, & there was no way I was missing it. The advice-nurse kept insisting, saying it would only be a quick 30-min diagnosis. They thought I prob had Vertigo. I explained to her that the last time they told me to come in for a quick 30-min diagnosis (for a migraine), I ended up getting admitted for 5 days (for viral meningitis). So, I wasn’t coming in until I got back from this party, & we could set up an appointment for next week. Which we did, & I went to it yesterday, & I do have Vertigo, & they gave me a prescription. And as I’m typing this, I am SOOOO dizzy & light-headed; & feel like I should go lay down. Ok, back to the post. When I’m not feeling well, I like to stay at my mom’s house. Yes, clichéd. But that’s me. My mom treats me well, & I can watch Ellen with her during the day. So, to set the scene, I was at my parent’s last night watching American Idol. And they were naming all the things the American Idol winner gets. Pappa: Whoa, If only D could sing! Then, we could put her up in American Idol & she could try to win it. It’s too bad she isn’t that talented. My mom: It doesn’t matter anyway, she could NEVER go to American Idol, even if she could sing! Ma: Cause she’s way too old. They have an age limit to that, you know. Uh…. WAHAT!! I’m sitting right here ppl! While they’re discussing my inability to sing & how old I’ve become. So, long story coming to an end (can’t really say “long story, short”, eh? ), I’m sleeping at my own house tonight. For the 1st time in over a week. So, TIoP just posted that MSNBC finally canceled that stupid Cracker-Jack Crack-head’s show. Oh, you tough football boys crack me UP! Thanks for this, though. I did need a laugh today. I mean, whatev, maybe they are piping in extraneous noise. I just really don’t think the Pats are in any position to point fingers at any other team right now. Sorry, kids, but you kinda forfeited that right when y’all went shady. Not that all the football teams aren’t being shady. Cause they’re all pulling something. They are guys, after all. Now I’ve gotta stay up late to see what Dave’s gonna say about this. Cause Dave films his show around 4-ish, & the story’s out already, & the Colts are his team. *click on the pic to go to the story. Oh, & ProFootballTalk.com has audio of it. UPDATE: Dave’s in reruns this week due to the Writer’s Strike. So, I’ll be in bed by 9:30 pm (since I only got about 4 &#189 hours last night). I was going to respond to your comment, but then I sorta started rambling, & figured I’d do another post. So, this is actually kinda an extension to yesterday’s post about the Transformers movie. I mentioned the mystery trailer preceding the movie. It’s supposed to be some new sci-fi-ish monster-ish movie by our very own Bad Robot. I’m pretty interested in this movie, & I know a bunch of other ppl are too, so I figured I’d collect everything I know so far into one post, & maybe we can make some predictions. It’s turned into so much more than the movie for me, I love a good real-life mystery. My boss once told me I should’ve gone into work for the FBI or become a private detective. I love this stuff. 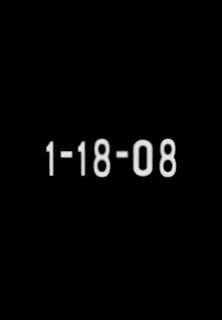 The only real official site so far is 1-18-08.com. It’s only got snapshot pics on it. But every so often, they add a new pic, & you can click on each pic & drag it around your screen. Ya, sorry, but that’s all I’ve got so far. JJ says that there’s a few other movie websites out there, but I guess it’s a viral marketing campaign, & they’re not telling what the actual sites are. JJ wants us to find em for ourselves. There’s another website called Slusho.jp that some have confirmed is an official website for the movie; but I’m not buyin it unless I hear it from an official Bad Robot or Paramount source. Slusho is a (fictional) frozen drink (Slushie) that Vaughn offers Sydney when they first meet in that official debriefing in Alias. I guess there are some “Ethan Haas” websites out there supposedly about the movie, but they’re fake. Also, ParasiteMovie.com is a fake. So, I haven’t even gone to them, b/c they might cloud my judgment. Yeah, that’s how into my detective work I get. And there’s rumors that the monster might be Cthulhu Mythos or Godzilla, or might tie in w/ Lost; but I’m not buyin that either. Very skeptical, am I.
Ok, so I’ll update this as I find out more stuff (unless I get too lazy). I did post that YouTube video that shows the trailer in my previous post, but Paramount might have their lawyers take it down. If so, you can go to Apple’s site, b/c Paramount gave them the trailer (well, teaser really, right?) to post there. You can go to Apple.com to see it, or you can click on the pic for the teaser to the left. I haven’t been posting, but I’ve been visiting all your blogs/sites. I haven’t really felt like posting, & have been worried about the state of our relationships w/ each other. I mean in this country as a whole. How we all relate to one another. And I didn’t want to just keep harping on it. Ya know? So, I’ve just not posted. Anyhoo, you should all know that it’s beautiful outside. Did’ja see 30 Rock last night?!? They were in love w/ Cleveland last night; so much so that they’ve put up a C-town guide on their site!!! Yes, I’m excited b/c I’m a Clevelander through & through, & I do love this town. It’s gorgeous here today. Oh, if you like 30 Rock, you should try their online “Marry, Boff, or Kill” game. It’s a game they play on the show. Ok, back to my whole “it’s beautiful outside” thing. It is. Beautiful. Gorgeous. And it inspires me to take more pics. I’m carrying my cam around w/ me again all the time; & if I see something, I’m documenting it. Also, this week’s PhotoFriday challenge is “Country”. AND I’m going out of town on holiday, & I’ll be driving through the countryside!!! So, I’m planning on submitting my pic this coming week. Hope y’all are doing fine. And I hope to have more to post soon.